Race week has arrived! I started the week with the beginnings of a head cold, so backed right off and took it easy trying to shift it. This seemed to work, so for my final taper run I pushed the intensity as I usually would before a race. This resulted in knee pain on the Friday, which needed a quick assessment from a health professional. I was given the all clear to run and raced on Saturday as planned. Feel free to read my full race report for The Peddars Way Ultra Marathon to find out how it went. Complete rest, panicing about my knee! First ultra of the year and what a race, or at least not in my case. A race of two halves weather wise, cold and clear for first half and then full on winter conditions for the second half, with strong winds, freezing temperatures and blizzards. Snow and mud do not make the best ground conditions for running on. Weather aside I was miles away from my A game. From the off just felt wrong and like I was running through treacle. I was struggling to keep my HR down despite going at a nice easy pace and then at 20km both my quads started to hurt. How on earth am I going to get to the coast! I pushed on quickly through CP1 and passed my support crew shortly afterwards. By this point my shoe was bruising my ankle bone and I opted to change this at CP2. Leaving CP2 things still didn’t feel good and then it snowed, really showed! I threw on every layer I had, hunkered down and struggled on with my sore quads. Suddenly at 55km it felt different, the quads still hurt like hell but I felt like I could run and even race. Too little too late. I managed to catch 7 people before the finish but by then the damage was done. Pleased to finish strongly in 22nd place but how could the race been if my body had played ball from the off!? 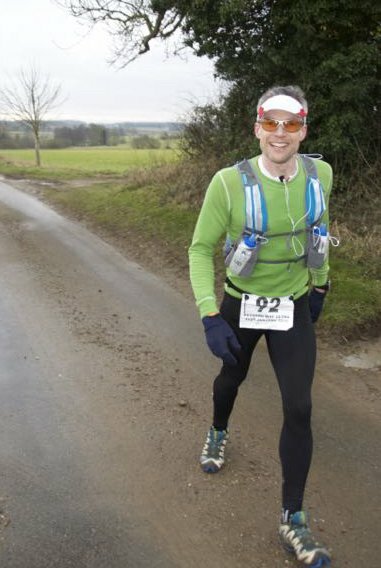 Read my full race report for The Peddars Way Ultra Marathon to find out more about my race. Rest no training at all!! Well its pretty simple really, there is no plan! Following the race my quads are pretty busted, so the aim of this week is to rest and recover, with any training taking place only when my body feels up to and at a nice easy place. The earliest I will run will be the weekend but it’s likely to be the following week to allow total recovery.